The world is a flat disc covered in rainforest and bisected by a river . Above the clouds is Heaven. On the disc's surface are the 600 'people'-the ones who have survived the depredations of the 'outsiders'-and even 500 of these have been exiled to a reservation. Film-maker Adrian Warren travelled to the land of the last of the sad and 'savage' Waorani. The Waorani tribe of Amazonian Ecuador first became world famous in 1956, when they speared to death five American missionaries who had landed their light plane on a riverside sandbank and were trying to explain their plans to build an airstrip. Outsiders may have been shocked by the manner of the missionaries' departure, but to the Waorani, no way of dying could have been more ordinary. Spearing accounts for 40 per cent of deaths, usually in interfamilial vendettas; 20 per cent are shot or kidnapped by outsiders-a fact that may have influenced their way of greeting missionaries; and snakebite and other accidents account for most other deaths. Only about 1 per cent are 'natural'. Waorani; to the Waorani, means 'people'. But to Ecuador's predominant indigenous group, the Quechua, they are Aucas, 'savages'. Indeed, there is much about their life-style that would invite the label. They have no writing, no reason to count higher than 10 and no history other than a tribal recollection that their ancestors came from "downriver; long ago". They roam naked in the jungle, hunting monkeys and birds with wooden blowguns and curare-tipped darts; for pigs they use spears. They also Use spears to deal with the incapable elderly, and unwanted babies are strangled with vines, burnt or buried alive. And by and large their contacts with the Quechua or any other outsiders have not been notably peaceable. But it is they who have suffered. Only 600 survive today, and 500 of these have been moved to a reservation, where they are increasingly influenced by Western ways. Of the other 100, half remain mercifully uncontacted. The rest live traditionally, but being aware of an outside world, they are at the top of a slippery slope which leads to the loss of most of their culture, exposure to Western diseases to which they have no resistance and, for any survivors, a life that will end in bewilderment on a reservation. One outsider who has contacted the Waorani without kidnapping, murder, exile or religious conversion in mind is the American anthropologist Jim Yost, who has managed to live with one group off and on for the past 10 years and now knows them so well that he thinks of them as his family. Desperate over the Waorani plight, he decided to make a collection of artefacts, a medical survey and a film record of their culture before it was too late. To this end he persuaded the BBC to join an expedition to visit his 'family', in the hope that a film shown on American and British television might arouse public interest in the Waorani and, for that matter, all Amazonian tribes. Our journey began in Quito, 2,750 metres up in the Andes. The team- Jim Yost, four other Americans, BBC cameraman Hugh Maynard and I travelled for eight hours by bus across the Altiplano, and down through cloud forest to the base of the Andes-the western edge of almost 4,000 kilometres of unbroken rainforest. From here we took a light plane to the Cononaco River, and when we reached Waorani territory, we circled until we located the current encampment of Jim's semi-nomadic 'family'. They were beside the river, an unusual spot for them: their habit of staying deep in the forest and away from the river is what kept them isolated from the rest of the world for so long. We landed at a small oil-company airstrip about two hours' boat journey downstream and ferried ourselves and our equipment upriver in inflatable boats with outboard motors. Our preparation for the expedition had included learning some useful Waorani phrases, among them "Please don't kill me". On Jim's recommendation, we built our main camp about half a kilo metre up from the Indians' settlement. We chose a high ridge above the river. While at first the steep climb was inconvenient, four days later our wisdom paid off-the river rose more than six metres. Two metres more and our camp would have been swamped. The heat and humidity were oppressive, and we were constantly covered in wasps and small stingless sweat bees, which crawled over our bodies till wecould stand it no more and dived into the river to find a few minutes peace. Often we had visitors. Silently and without warning, a number of small, naked, dark brown bodies would emerge from the undergrowth to watch us, examine our hammocks, clothes, camera equipment and the strange things we were eating. Then they would melt away into the forest as suddenly and as silently as they had come. For the first few days, we kept away from the Waorani settlement, preferring them to come to us. We had no doubt that their acceptance of us depended solely on Jim Yost, whom they knew and obviously loved. Little by little during that first week, more and more of the Indians visited our camp for longer and longer periods, eventually smiling, relaxing in our hammocks and trying our food until Jim decided they were ready for us to visit them. We took no cameras in the boat, just ourselves, and after we landed, we walked up a long tree trunk which had been felled to make a path from the river to the tribal house. We were received warmly and followed Jim into the simple palm-leaf A-frame. Inside, shafts of sunlight filtering through the roof created a cathedral-like atmosphere. It was dark but spacious-about 12m long, 6m wide, and 5m high. Eighteen people lived here-four families-with no privacy at all. Non-interference is the ethic in Waorani society. There is no concept of competition or rank, children have the same status as adults, and men and women are socially equal, although there is the usual division of labour between them. Men hunt, women cook; men fell trees, women take care of the children; men make weapons and poisons, women weave ham- mocks. The air inside smelled strongly of wood- smoke. The six hearths, with smouldering embers, were surrounded by hammocks and crude hanging baskets bearing a few belongings. A few spears lay across the beams of the house, and three blowguns were each propped in the corner nearest to its respective owner . The fires are kept going continuously and are even carried around in a termite nest, which will smoulder for hours as the Waorani move to a new area. If for any reason they are left without a fire, a new one is lit by rubbing two sticks together . The forest provides the Waorani with every necessity of life. Dozens of different kinds of fruits can be harvested, trees are chopped down to get the honey from bees' nests and rotten wood is split open for juicy grubs. Fruits of the achiote and genipa plants yield dyes for decoration, gourds become vessels for storage and drinking, palm leaves provide the raw material for string and their midribs are split and carefully shaved to make blowgun darts. Chonta, a hardwood palm, yields the wood for blowguns and spears, and also fruit, which at certain times of the year becomes a main constituent of the diet. The bark of a special vine is the source of curare, used to tip blowgun darts: no poison, no monkeys to eat. Monkey meat is a basic part of the diet, and the Waorani like to eat well. On average, a hunter will go into the forest with his blowgun every three or four days. He usually goes alone and may wander through the forest for several hours before he finds a monkey. But once he has found one, it is as good as dead. Two hunters let us accompany them into the forest to film blowgun hunt- ing. Campaedi took his grandson Ahua, who at nine was almost old enough to hunt by himself. Karowe took his wife and baby for company. For the first few days in the forest we were inadequate, fumbling with our equipment, getting the tripod stuck in overhanging vines and branches and generally making too much noise. But little by little, helped by Waorani patience, we improved and eventually went on some successful hunts. As might be expected, they always spotted the monkeys before we did. They could even smell them, and when they did they would sometimes call them with a blood-curdling shriek that ought to have scared everything for miles. But it did elicit a response-curiosity-and the target thus identified, Campaedi or Karowe would quickly load the blowgun, keeping their eyes fixed on the foliage 50m above. Raising the heavy 3m long blowgun to his mouth and filling his lungs with air; he blew so hard that his body contorted with the release of tension. The crashing sound above told us the monkey had been hit and was dashing through the canopy in a panic, trying to find somewhere to hide. This is the critical moment of the hunt: lose sight of the prey now and you may never find the body. The single dart may not have embedded itself well enough, and in any case the effect of curare is not immediate. The hunter must follow his prey and put more darts into it to ensure an efficient kill and a successful hunt. By pumping darts into the bunch of foliage where the monkey was last seen and shaking vines, the hunters eventually force the monkey to move, and it is spotted. A few more darts and it becomes groggy, finally falling asleep in the tree or falling with a thud on to the soft forest floor. If it is stuck up in the trees, a climbing ring is made from vines, and the hunter shins up to retrieve it. The hunters work hard, in constant danger from snakes and jaguars as they creep through the foliage. Campaedi encountered a jaguar while we were there. He and the cat, which was only a few feet away, surprised each other, and with no suitable weapons, Campaedi had to throw sticks at it until it slowly departed. A hunter called Koba had been attacked three times by jaguars. One of them had tried to leap on him, but he impaled it on a spear as it pounced. One hunter had fallen out of a tree and died just before we had arrived, and Karowe's wife had been bitten by a snake. Her right foot became withered, but at least she survived. The hunter returns to the house with his dead monkey and throws its limp body on the ground next to his wife. She might summon a young boy to rub his hands on its body, so that he can absorb the monkey's strength and become a successful hunter when he grows older . The meat is prepared and distributed equally to everyone. The following day the hunter sits quietly at home refurbishing his armoury of blowgun darts, each beautifully made, all the same length, tapered and sharp. A pile of shavings collects under his hammock. Meanwhile the women go off into the forest, carrying their babies in slings, to harvest a garden of manioc planted nine months earlier . The soil will not support more than one crop. So a new garden is cleared and planted every few months, and three or four gardens at different stages of maturity are tended at once. The Waorani may move house to be nearer the site where the next most advanced crop is growing, burning the old house to destroy any insects that have infest it, leaving it a habitable site if they ever wish to return. The Waorani idea of the world is very simple: a flat disc of forest with mountains (the Andes) on one side. Down the centre flows a river, the water of which is recirculated round the edge of the disc to flow through once more. Above, in the clouds, is Heaven, where all Waorani go when they die and where all the animals they have hunted are waiting, to provide food in the afterworld. The forest had been our world for one month. This was the world of the Waorani. They have hunted the same forest for generations, but pressure from outside increasingly threatens their Eden. When it was time for us to leave, we said good-bye to these strange people, violent yet gentle, living in perfect equilibrium with the forest. For their part, there were no emotional farewells. We departed as friends, even though there are no words for friendship in the Waorani language. Acero C., Gloria y Dalle R., M, (1989): Medicina Indigena. Cacha-Chimborazo. 3rd. ed. Abya-Yala. Quito. 172 pp. Anthony, H. E. (1921): The Jibaro Indians of Eastern Ecuador. Natural History XXI (2): pp. 146-149. Arcos, G. (1979): Evolucion de la Medicina en el Ecuador. Casa de la Cultura Ecuatoriana. Quito. Arevalo, A. Oldeman, R.A. A & Yost, J. (1976): Algunos recursos vegetales del territorio Wao (Auca). Informe multigr. Ministerio de Agricultura y Ganaderia, ORSTOM. Quito. 20 pp. Arguello, A. La Etnobiologia en el Ecuador. In: Rios, M. & Borgtoft Pedersen, H. (eds. ), Las plantas y el hombre. Herbario QCA y Abya-Yala, Quito. Arguello, S. (1987): Enfermedades de campo y enfermedades de Dios, etiologicas de la medicina tradicional. Tesis de Licenciatura, PUCE. Quito, 211 pp. Barral, H. (1978): Informe sobrela colonizacion en la Provincia del Napo y las transformaciones en las sociedades indigenas. MAG-ORSTOM-CAME, Quito. Barrett, S. A. (1925): The Cayapa Indians of Ecuador. Indians Notes and Monographs. Museum of the American Indians, Heye Foundation. New York 40:1-476. Benitez, L. & Garces, A. (1987): Culturas Ecuatorianas ayer y hoy. Abya-Yala, Quito. 231pp. Blomberg, Rolf. (1956): The Naked Aucas: an Account of the Indians of Ecuador. George Allen and Unwin, London. Blomberg, R. (1956): The Naked Aucas. Published by George Allen and Unwin Ltd., London. .
Butler, Thomas (1979): Birds of Ecuador and the Galapagos Archipelago. Ramphastos Agency, Portsmouth, New Hampshire. Chantre y Herrera, J. (1947): Historia de las Misiones de la Compania de Jesus. Quito. Davis, E. W. & Yost, J. A. (1983): The Ethnobotany of the Waorani of Eastern Ecuador. Bot. Mus. Leafl. 29(3): 159-217. Cordero, L. (1955): Diccionario Quichua. Casa de la Cultura Ecuatoriana. Quito, Ecuador. Davis, E. W. & Yost, J. A. (1983): The Ethnomedicine of the Waorani of Eastern Ecuador. Journ. Ethnopharm. 9(2-3): 273-298. Davis, E. W. & Yost, J. A. (1983): Novel Hallucinogens from Eastern Ecuador. Bot. Mus. Leafl. 29(3): 291-295. .
Elliot, Elisabeth (1957): Through Gates of Splendor. Harper & Brothers, New York. Elliot, Elisabeth. (1977): The Savage my Kinsman. Published by Harper & Row, USA. Elliot, Elisabeth (1978): The Journals of Jim Elliot. Published by Fleming H. Revell Company, New Jersey. Elson, I. E. (ed. ), (1962): Studies in Ecuadorian Indian Languages. Linguistic Series 7. -Summer lnstitute of Linguistics, Norman, Oklahoma. pp. 78-95. Flornoy, B. (1953): Jivaro: Among the Headshrinkers of the Amazon. Elek, London. Fruci, S. & Broseghini, S. (1984): El Cuerpo Humano. Plantas y Hierbas Medicinales de los Shuar. Abya-Yala, Quito. Fugler, C. M.& Swanson, W. L. (1971): Biological and Ethnoecological Observations on the Cofan, Secoya and Awishiri Indians of Eastern Tropical Ecuador. Proceedings of the Oklahoma Academy of Science 51: 106-119. Gartelmn, K.D. (1977): El Mundo Perdido de los Aucas. Quito. Gillete, C. (1970): Problems of Colonization in the Ecuadorean Oriente. M.A. Thesis, University of Washington. St. Louis. Graff, Fritz W., Up de (1923): Headhunters of the Amazon. Herbert Jenkins Ltd.
Griffin, Bob (1998): Cleared for Take-off: Forty nine stories from the pen of a Jungle Pilot. Published by JAARS, Inc.. ISBN # 1-878606-21-2. Grohs, W. (1974). Los indios del alto Amazonas del siglo XVI al XVIII: Poplaciones y Migraciones en la Antigua Provincia de Maynas. Bonner Amerikanistiche Studies 2. Bonn. Harner, M. (1972): The Jivaro, People of the Sacred Waterfall. Anchor, New York. 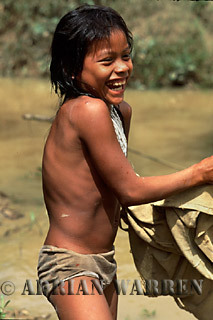 Harner, M. (1978): Shuar, Pueblo de las Cascadas. Edic. Mundo Shuar. Quito. Hitt, Russell T. (1964): Jungle Pilot. Published by Hodder & Stoughton. Jouanen, J. (1948): Historia de la Compania de Jesus en la Antigua Provincia de Quito. Quito. Kaplan, J. E., Larrick, J. W ., Yost, J. A., Farell, L., Greenberg, H. B., Herrmann, K. L., Sulzer, A. J., Walls, .K. V. & Pederson, L. (1980). Infectious Disease Patterns of the Waorani, an Isolated Amerindian Population. Am. J. Trop. Med. Hyg. 29(2): 298-312. Karsten, R. (1935): The Head-Hunters of the Western Amazon: The life and Culture of the Jibaro Indians of Eastern Ecuador and Peru. Comment. Humanarum Litterarum, Soc. Scient. Fennicum 7(1):1-614. .
Kingsland, Rosemary (1980): A Saint among Savages. William Collins, Sons & Co. Ltd., London. Labaka, Alejandro (1988): Cronica Huaorani. Ediciones CICAME, Vicariato Apostolico de Aguarico, Ecuador. Larrick, James W., James A.Yost, Jon Kaplan, Garland King, John Mayhall (1979): Patterns of Health and Disease Among the Waorani Indians of Eastern Ecuador. Medical Anthropology, Vol. 3, No.2, Spring 1979. Larrick, J. W ., Yost, J. A. & Kaplan, J. (1978): Snake Bite among the Waorani Indians of Eastern Ecuador. Trans. R. Soc. Trop. Med. Hyg. 72(5): 542-543. Larrick, J. W., Yost, J. A, Kaplan, J., King, G. & Mayhall, J. (1979): Patterns of Health and Disease among the Waorani Indians of Eastern Ecuador. Med. Anthrop. 3: 147-191. Los Aucas y los Canibales. ILV. 1964. Mason, J. A. (1950): The Languages of South American Indians. In: Steward, J. H. (ed. ), Handbook of South American Indians. US Government Printing Office, Washington D. C., Vol. 6: 157-317. Meggers, Betty J. (1971): Amazonia: Man and Culture in a Counterfeit Paradise. AHM Publishing Corporation, Arlington Heights, Illinois. Murra, J. (1946): The Historic Tribes of Ecuador. In: Steward, I. H. (ed. ), Handbook of South American Indians. US Government Printing Office, Washington D. C., VoI. 2: 785-821. Culturales de la Amazonia Ecuatoriana, Quito. Patzelt, Erwin (1979): Fauna del Ecuador. Imprenta Europa Cia. Quito. Patzelt, Erwin (1976): Libre como el Jaguar. Quito. Peeke, C. (1979): Gramatica Huaorani. ILV. Quito. Salazar, E. (1981): The Federacion Shuar and the Colonization Frontier. In: Whitten. N. H. (ed. ), Cultural Transformations and Ethnicity in Modern Ecuador. Univ. Illinois Press, Urbana, Chicago, London. pp.589-613. Stirling, M. W. (1938): Historical and Ethnographical Material on the Jivaro Indians. Smithsonian Institution, Bureau of American Ethnology. Bulletin 117: 1-148. Stoll, D. (1976): Carta a los Misioneros. Archivo de la Prefectura Apost. de Aguarico. Summer Institute of Linguistics (ILV), (1964): Los Aucas y Los Canibales. Summer Institute of Linguistics (1968): The Tapir, by Giketa. Workpapers concerning Waorani Discourse Features. pp. 133-143. Summer Institute of Linguistics (1991): Listas Comparativas de Palabras en Diez Idiomas Autoctonos Ecuatorianos. Cuadernos Etnolinguisticos, No. 13. Vellard, J. (1965): Historie du Curare (Poisons du Chasse en Amerique du Sud). Collection L 'Espece Humaine. Gallimard, Paris. Vickers, W. T. (1972): Indians. Oil and Colonists: Contrasting System of Man-Land Relations in the Aguarico River Valley of Eastern Ecuador. Latinamericanist (University of Florida): 8(2): 1-3. Villarejo, A. (1959): La Selva y el Hombre. Edit. Ausonia, Lima. Wallis, Ethel Emily (1961): The Dayuma Story. Hodder & Stoughton. London. Wallis, Ethel Emily (1973): Aucas Downriver. Hodder & Stoughton. London. Warren, Adrian (1984): Waorani: The Last People. BBC Wildlife Magazine Vol.2 No.9 September 1984, pp. 454-457, photos. Whitten, Norman E., Jr. (1976): Amazonian Ecuador: An Ethnic Interface in Ecological, Social, and Ideological Perspectives. International Work Group for Indigenous Affairs. Whitten, N. E. Jr. (1976). Ecuadorean Ethnocide and Indigenous Ethnogenesis: Amazonian Resurgence amidst Andean Colonialism. IWGIA Document 23. Copenhagen. Whitten, N.E. Jr. (ed.). (1981): Cultural Transformations and Ethnicity in Ecuador. Univ. of Illinois Press. Urbana, Chicago, London. Yost, J. A. 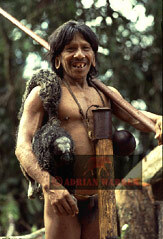 (1981): People of the Forest: The Waorani. In: Ecuador: In the Shadow of the Volcanoes. Libri-Mundo - Quito. pp. 96-115. Yost, J. A. & KelIey, P. M, (1983): Shotguns, Blowguns and Spears: The Analysis of Technological Efficiency. In: Hames & Vickers, W. T. (eds. ), Adaptive Response of Native Amazonians. Academic press. New York. Pp. 189-224.